Why did I want to have a natural birth? That is a very interesting question that can have quite the list of reasons. But, for ME, I think the answer is fairly simple and uncomplicated… it’s just the way I’ve wanted to do it. Yes, I wanted to protect my baby and myself from anything potentially harmful. And yes, I definitely did not want any serious interventions (i.e. c-section) if they could be avoided. Mostly though, I knew my body was made to do certain things, and in a bit of a selfish way, I wanted to prove to myself (and anyone else that might doubt me or it) that it could be done, and that I was capable. Maybe this strong desire to do something as naturally as possible also stems from how “unnaturally” I feel that our little girl was conceived. Having experienced infertility for nearly two years, we were starting the procedures that would be our “last hope” at getting pregnant. One of the greatest blessings we have received was to have our first attempt at Intrauterine Insemination (IUI) work. Two weeks after the procedure I held my breath every time I took a pregnancy test, and tried to keep my hopes from getting too high, as every time the two lines got darker. The time came to really celebrate when the blood tests came back positive. We were beyond thrilled! I started my pregnancy seeing an OB/GYN. She was nice and helpful, but I started getting the feeling that things weren’t right and that I wasn’t going to be able to easily get the birth experience I wanted. I then started researching some other options and attempting to inform and convince my husband that these other options were just as safe and “normal” as delivering at a hospital. Before I knew it, I had transferred myself out of a doctor’s care, and into that of a midwife’s (Toni Kimpel). 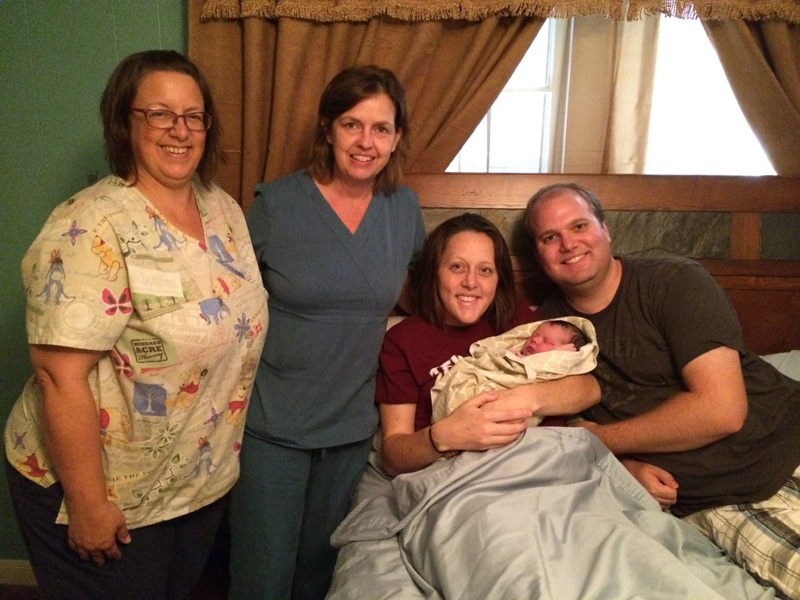 Between a home birth and a hospital birth, my husband and I agreed to meet in the middle with a birth at the birth center (Jubilee Birth Center), and I couldn’t be more contented with our decision. At my 40-week appointment with Toni, I felt as though I might have been having contractions all morning. Having never experienced labor, I was unsure of what I was feeling, but knew that I was having some period-type cramps at semi-regular intervals. So, Toni asked if I would like her to check and see if anything was going on. I said yes, and she found me to be 2cm dilated and 20% effaced. Basically, this told us nothing as to when labor might be getting underway. So, I left my appointment with instructions to just let Toni know if anything picked up or changed. Well, it did not to say the least. 3 days after my appointment with Toni (a Saturday), I was feeling just as good and normal as ever. Those period-type cramps had disappeared and I was feeling like my typical pregnant self. That basically means I was feeling great. I was fortunate to have a very pleasant pregnancy, with very few annoying symptoms. Anyways, being past my due date and feeling so normal kept me wondering if our little “Peppermint Patty” (nickname– Patty is our last name) would ever make her appearance. Around dinnertime I felt as though I needed to go and check my underwear in the restroom. I found some blood and immediately texted Toni to make sure this bleeding wasn’t something to be concerned about. She texted me back saying that it sounded like bloody show and asked me if I was experiencing any contractions. Again, not knowing anything (other than what I had learned from books and classes and heard from others) about labor and contractions, I chalked up what I was feeling to Braxton-Hicks and told Toni that I wasn’t having anything regular or substantial. But, the more I thought about it they did feel just a bit stronger than anything I had experienced before. Nonetheless, Toni told me to “eat dinner, drink plenty, maybe take a walk, get a shower and go to bed.” So, that’s what I intended to do. I had my dinner, took the dog for a walk, drank lots of water, showered, and then attempted to go to bed. Sleeping did not work very well. Around 11pm I knew things were different. I still doubted that labor was actually happening, but the contractions were definitely stronger. So, I texted Toni, who told me to keep trying to get some sleep and instructed me on when I should let her know that things were really getting going. I also texted my mom to get on that night’s flight and start heading our way. I didn’t want to jinx anything, but it was looking too serious to not get her out here. After I made contact with those two, it was back to bed. I believe I got about an hour and a half, maybe two hours, of sleep before I was awake again and the contractions were to the point that I couldn’t ignore them, much less go back to sleep with them. So, I got up and started trying to cope with and time them. Toni had said I should let her know when the contractions were lasting for a minute and coming every 5 minutes for an hour or more. Around 4:30am I felt like it was time to inform Toni that the contractions were matching that timing. 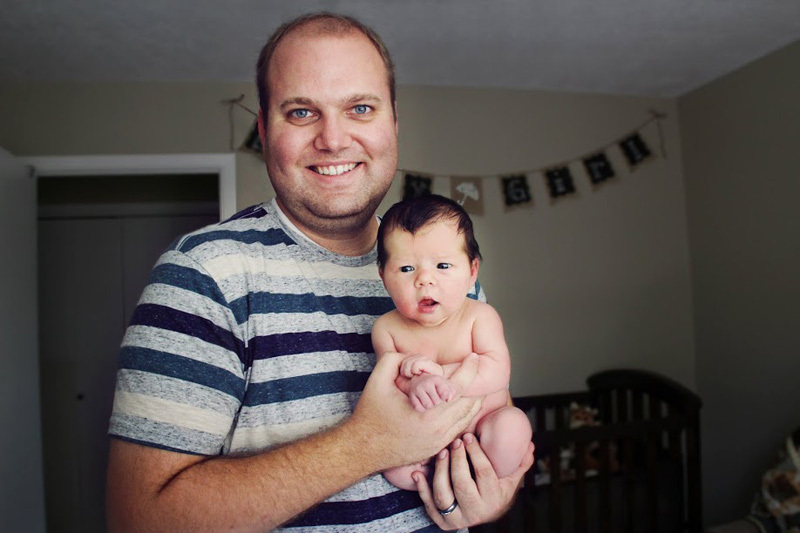 I then woke up Spencer (who had no idea I’d been up laboring for the previous 3-4 hours) and told him to get ready…We were probably going to have a baby that day! We all met at the birth center around 5:45am. Toni checked us in. She checked the baby’s heart rate, which sounded great, and we found that I was between 6-7cm dilated and Toni could feel the sack bulging. All very good signs! I was shocked that I had managed labor to that point, and the contractions were still feeling very bearable to me! They were intense, but bearable. At some point during those first few hours of laboring, I remember Toni even telling me how well she thought I was managing the contractions. I think we were all wondering if we would even know if I was in transition. Toni said to inform her if we noticed anything changing at all, because that might be the only way we might know. Hearing all these things made me feel really good and really strong. 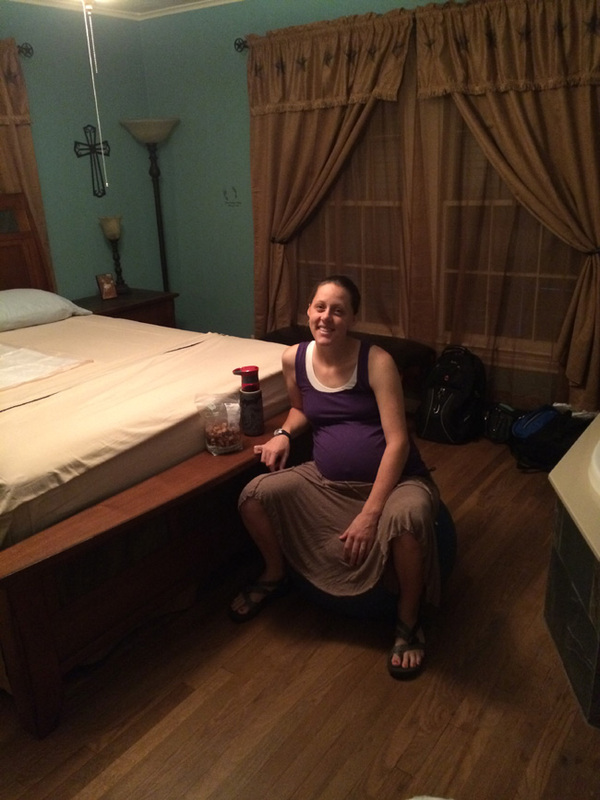 I really enjoyed laboring on the exercise ball for the first little while. Spencer was really active in trying to comfort and take care of me. I think he felt a tad bit guilty that he had been able to sleep through me being awake and laboring alone for most of the night. He would offer me any comfort measure we had learned about in our birth class (rub my back, use tennis balls, counter-pressure, slow dancing, etc). He also made sure I was fed and hydrated. He did a good job, but I think my approach to labor is a little more independent. I want him there and don’t want to be alone, but I don’t need the constant waiting on me hand and foot type thing. I think Spencer eventually caught on to that fact and a few hours into it all we were working really well together. An hour or two into being at the birth center, I asked Spencer to ask Toni if we could try out the tub. Wow, it felt really good. The only problem was that I think it made my contractions stronger (which really isn’t a bad thing if it meant I was dilating more). After a bit of soaking in the tub, I was starting to moan a bit and really having to concentrate every time those waves rushed through me. Toni came in to check on us and I asked how we would know if I was fully dilated or if something was keeping us from progressing? She offered to check and see and I said yes. So, I climbed out of the tub and sat on the birthing stool. Well, we found that I was fully dilated and there was just a bit of the cervix in the way. My water still had not broken at this point either, so there were several options of things we could do to try and move labor along. The first thing we decided to do was to have Toni break the bag of water. As she did so, she commented on how tough the bag seemed. It did not want to break easily, but it did finally break (with clear amniotic fluid). The second thing we did was try and move the lip of the cervix out of the way during some contractions. At this point, things start getting a little hazy in my memory. Contractions really picked up, and there was a slight urge to push. So Toni had us roll with it. I couldn’t rest very well between contractions on the stool, thus we decided to move to the bed. In the process of moving over to the bed, I started feeling a little shaky and like I had pins and needles all over my skin. I was also beginning to feel very tired and like I was having a hard time catching my breath. I was given some oxygen and that made things a little better. I was instructed to push whenever I felt the urge to do so. Honestly, I can’t say for certain if I experienced any instinctual urge to push. But, I do know that my brain was basically screaming at me that I really wanted her out! I’m not exactly sure when transition occurred… Part of me thinks that transition happened sometime during the two hours of pushing. I think this, because I can distinctly remember going through a time of doubt and uncertainty that I could finish the task at hand. It may have been a combination of little sleep and exhaustion, but I began feeling as though I had reached my pain threshold. This small piece of my labor experience I remember with a lot of embarrassment. I felt as though I couldn’t hold it together anymore. During one push, I started to scream. Toni was so kind and gentle. She just calmly spoke to me saying something like, “Keri, Keri, I don’t mind being loud, but screaming isn’t going to help. Instead try putting that effort into lower sounds.” I was quite obedient and impressionable. I remember apologizing for screaming and apologizing for a lot of other things too (like vocalizing how I wished someone else could do this for me). Whenever I got any direction on something I could do or change, I would say, “I’m sorry,” and do my best to do what I was told. Maybe someone just needed to tell me to stop being so “Debbie Downer.” But I got supportive, patient and kind responses instead (so terrible, right?). Pushing lasted for about 2 hours. And it was 2 hours of HARD work. This stage was definitely not my favorite. I thought I would find pushing to be a relief… But that just wasn’t how it was. At one point, my exhaustion was clearly evident to my support team. I remember actually falling asleep in between a couple contractions. I also remember Toni saying how it was so great that I was getting such good rest and everyone else chuckled about how they wished they could be getting some rest too. Even with this good rest, the 2 hours was very taxing. I was ready for my baby to get here (although I wasn’t too keen at the time that I had to do it) and I was getting frustrated that my pushes weren’t making the progress that I thought they should. I guess I was a bit naïve to think that it might take only a few good pushes to get her out. But, the reality was that she would move down a bit, but then slide right back in. There was progress, but definitely not the quick progress I wanted and wished for. But, she did make her way down. Around the time when the top of her head appeared, everyone began to say how she had so much hair. They asked if I wanted to reach down and feel, saying that it might help give me some extra motivation to get through it all to feel my baby. But, the first time they mentioned it, I was not in the mood and declined quickly. They also asked if I wanted to see. Without really responding, they brought in the mirror and showed me what was going on. Seeing the top of her head and all the hair was fascinating. I knew I had to touch her then. Her hair was oily from the oil that Toni had been using to help massage and stretch the perineal area, but it was incredible! There was a little, warm, soft head with long, dark hair! Everyone was right; it was just what I needed to finish what had started (and couldn’t be stopped). I can’t remember exactly how long it took from that point until her head was out, but as soon as that happened there was SO much relief. Another second later I was being told to “reach down and take your baby. Keri, reach down and get your baby.” Incredible, marvelous, wonderful, extraordinary, amazing, wondrous… all words I could use to describe how I felt and what that moment meant to me. I get emotional just thinking about it. 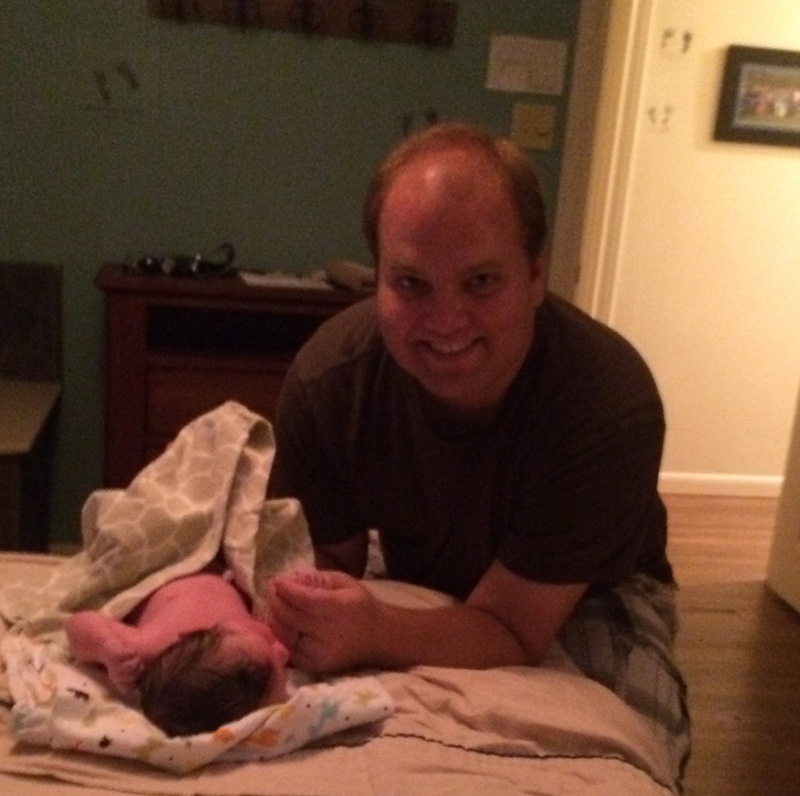 Although Camille was born a little bigger than we all expected, she was perfect and healthy (8lbs 14oz, 20.75in long). Heavenly Father has definitely been so good to us by bringing this sweet little girl into our lives. I am so honored and humbled to be given the responsibility of being her mother. It was 4:30 am and I was sound asleep when I started to find my wife looking down at me. She softly said, “I think we are heading to the birth center in about an hour. You can either get up or go back to sleep, but you need to be ready in an hour.” I could not go back to sleep. Around 5:30 am we left our house and drove through the already lightening streets to the birth center. Who in their right mind would be out driving around at 5:30 in the morning? There were a few people on the road but it wasn’t too bad at all. We had thought about running drills on alternate routes in case a certain road was shut down or too busy but never quite got around to it. Lucky for us, it wasn’t needed. We arrived at the center and parked in what would later turn out to be a very hot spot but it seemed nice at the time. Inside we checked in with Toni and filled out some paperwork. After checking all the vitals, she said everything was looking good. She was dilated to around 6 or 7 cm so things were definitely moving along just fine. Surprisingly, Keri didn’t seem in that much discomfort. She has always had a high pain tolerance so I thought she was just bearing the pain. Later I found out that the pain really hadn’t even started much. We had Keri sit on a bouncy ball after we went out in the front room and I sat on a cushy couch. I was in charge of fielding text messages and phone calls from family members and so between contractions I was typing as fast as my awkward thumbs and pointer fingers could go. She was focused and doing really well. 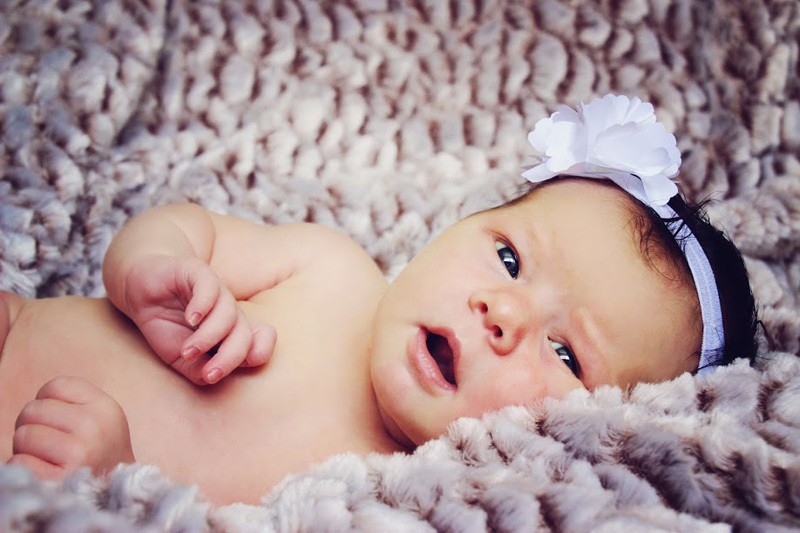 When a contraction would come, she would get focused and then make little grunty and moany noises, like ugg or gruuuhhh or muhhhhh, the type of sounds that signify a tummy pain. We were out there for around 45 minutes while Toni and Andrea were preparing the bedroom and rinsing down the bathtub so it was extra clean and comfortable. When they finished, they told us we could head on back and make ourselves at home there. We brought the ball and I took to spreading out our stuff. We had brought some trail mix and water with us, which I pulled out for Keri (and me) to munch on. There were also a couple back and head scratching utensils and the tennis balls in a sock apparatus. It turns out that none of those appealed to Keri during her labor, so they sat lonely and unused where I first placed them, but at least they made it out of the bag and got to witness the awesomeness… By this time her pain was starting to get more intense and so she started pacing between contractions. For some of the contractions, she bent over a bit to brace herself on the bed. For others, she came and hung on my shoulders and I held her close like we were slow dancing. We did a bit of that as well to keep her moving. I created music in my mind as we swayed back and forth. Most of this time, we were on our own. The midwives would come in every half hour or so to measure the baby’s pulse but mostly we had the room to ourselves. Keri was dealing with the pain using vocalizations. I was happy for it because it gave me a sense of what was happening and how hard each contraction was. They were still a few minutes apart so we had a bath drawn. This bath was humongous. It was deep and long, which is perfect since my wife is tall. They pulled out a thermometer to measure the water coming in and the water already in the tub. Apparently having it body temperature is optimal, or maybe it was a little warmer but not too much, I don’t remember exactly but I thought it was a great idea to actually measure the temp of the water. Keri got in and immediately exclaimed “ Oh man this feels good!” It was soothing for her between contractions but didn’t seem to help much during the contractions. She rested on her knees with her arms and face draped over the edge on a folded up towel for near an hour. I sat there and stroked her back and held her arms and hands when she needed some support and tried to keep us talking a bit. I didn’t mind some silence though. (I don’t think I ever really have minded silence but you see all these movies and books where the main characters always have things to say and it seems they never stop talking. Maybe that is what I have been comparing against because I often felt like a failure when there was a lull or long stretch of silence. That is, I often felt this way until I met and fell in love with Keri and realized that silence can be just as special as conversation.) This was one of those times where we were working our way through the stages of labor and having that time to reflect on each other and what was happening then and there was exactly what we needed. Keri was very focused and I could tell she was willing her body to open up more quickly and get that baby out of there. After the bath, we checked again and the baby had dropped a bit. She was fully open but the cervix was still in the way. Keri built a hearty sack for the baby. It did not want to give way and let the baby slide down. She sat on the birth stool and leaned back onto my chest. I was sitting on the foot of the bed. Around this time the noise level coming out of Keri’s mouth had increased dramatically. Toni asked her if she felt like pushing at all and if so, to redirect some of that noise into the push. She did so and after a few contractions everything had opened up enough so that Toni suggested we break the water and begin the real pushing stage. Toni pulled out the white plastic pokey thing and broke the water. Keri was really feeling the urge to push so she pushed and pushed and pushed and pushed. For almost an hour we were in that position on the birthing stool with her leaning back on me. I can tell you it was exhausting for me since I had nothing to lean on and I was supporting her, but she could never relax between the contractions. Since she was trying to hold herself up, she started to run out of energy. Toni suggested we try some other positions to see if she could relax between contractions. She hopped on the bed on her back and that was good for a bit, but then not wanting to labor on her back, she tried on her side on the bed. That didn’t work so she returned to her back. She could finally rest! So there Keri is laying on her holding her legs up in the air… well, holding one leg up in the air while I hold the other up. I got to stand (and eventually I brought a stool over so I could sit between contractions) on her right side by the bed with one arm cradling her leg in the air and the other wrapped behind her back and neck helping her curl in to push better each contraction. We were in that position for about an hour as the baby worked it’s way out. I did get t osit down between contractions but much of the time we were helping Keri stretch her legs out or keep them pulled up to minimize the slide back of the baby. Each push she would move a little further out but then would gradually slide back up in. Keri kept asking if we were almost done and I could tell she was getting really tired of waiting. She would say things like “I just want to be done” or “I don’t want to push anymore.” We (Toni, Andrea and I) could tell the baby was progressing but I think Keri had a mental picture of it just sliding right out with a couple pushes. That was not how it happened. We could see our baby’s dark brown hair sticking out and around 11:30 am we started to see the top of the head moving out with each push. Toni told us that at some point she would be far enough out that she wouldn’t slide back in. We were exhausted but almost there. Keri was pretty much out of energy. Toni recognized this and said out loud a little prayer that things would continue to progress and that Keri would have enough energy to finish. It was answered! Keri was able to reach down and feel the top of our baby’s head. She was able to keep pushing and fifteen or so minutes later, the baby had reached that stage where she stopped sliding back in. Now, they were using olive oil and massage to help keep the perenium lubricated so our baby could slide through with out too much damage. Half her head was sticking out and she was almost there. One more big push and Camille’s head was out. Toni told Keri to reach down and catch her baby during one more big push. Keri reached down and grabbed hold of Camille and with a last push she slid out in Keri’s hands. She immediately rolled back onto her back speaking softly, “Oh my gosh, I can’t believe you are here. You are my precious baby girl!”, or something along those lines. I can’t remember exactly how she said it but my eyes definitely teared up with love and pride. It was a special moment between mother and daughter and father. All that pain and waiting was over and it was all worth it. She immediately rested on Keri’s chest. The hard part was over and the journey was just beginning. She almost immediately started feeding after they had cleared her mouth and throat with that suction doohickey. After a bit, the cord had stopped pulsing so they determined it was time to cut the cord. They handed me the scissors and I cut where they told me I should cut. It was a little squishy but also kind of rigid. Weird but not gross! After that they tested how attached the placenta was. It was loose so they told Keri to push and out slid the placenta. They decided that this was a good time to take the babies stats and measure her weight, height and all the other things they needed to do, like flexibility and strength. She got her special K shot in the leg and then she had a diaper change. They measured things at 5 minutes and then at 15 minutes (give or take ten minutes). 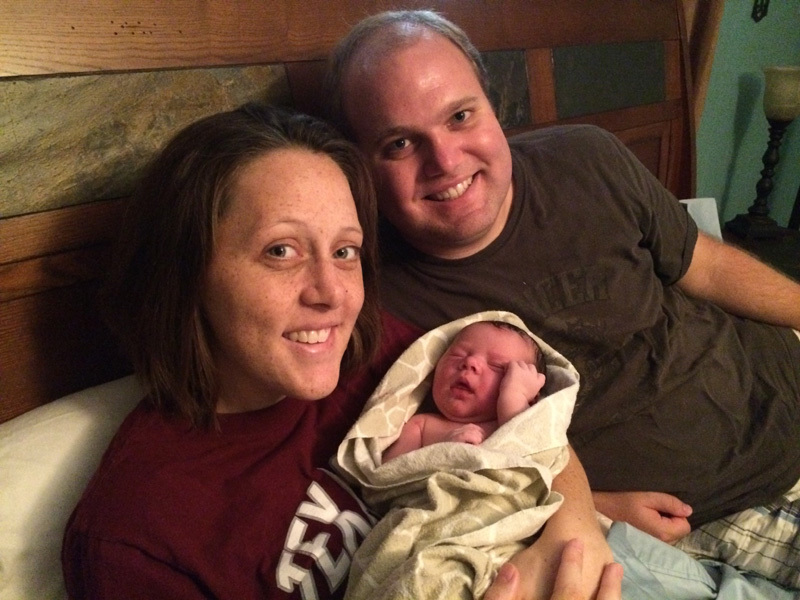 Camille Elizabeth Patty was born at 12:13 pm August 24, 2014 weighing 8 pounds 14 oz and measuring 20 ¾ inches long. After that, everything was kind of a blur. At one point we were feeding Camille, another time Keri was being helped slowly to walk down to the bathroom. We were rubbing Keri’s uterus to help it stay hard and clamp the bleeding and we were just enjoying the precious new moments with our baby girl. We wrapped her in a swaddling blanket and she was there on Keri’s chest most of the time. Camille fed pretty naturally. I guess that is what they instinctually do. Everything looked good there so it was pretty smooth. What a precious little bundle of awesomeness. After all that we were hungry so Andrea phoned in an order for us to IHOP then went down to pick it up. I had a stack of tasty buttermilk pancakes, three eggs with cheese, some sausage and hash browns. Keri had French toast with a strawberry topping. Yum! That hit the spot. We were just relaxing now and Andrea and Toni were finishing up their required paper work and monitoring Keri and the baby for the next hour or so until Keri’ s mother, Dawn finally arrived. She had left from Portland late the previous night when we told her it was happening and flew standby into Houston airport. From there she took a van shuttle to the College Station airport where Sadie Goddard, a friend, picked her up. While I was out greeting them, Toni decided to stitch up the rips that happened as Camille made her way out. I guess it needed a couple at the top and a couple at the bottom, but it wasn’t too bad. Next time we will be better about doing our perennial stretches… That took like half an hour so I had time to chat with Dawn and Sadie. At first we were out in the hot sun, so I suggested we go inside, but Sadie had some of her kids with her so she stayed out in the car to watch them. The plan was that I would come out in a bit to watch her kids while she could go in, but after 15 minutes, Keri still wasn’t done, so I went out and sat in the car while she went in. After 10 minutes of that, she decided just to bring us all in. I was watching Gracie and Max (her two youngest kids) while they went back to meet Camille and say hi to Keri. Luckily they had a little kid’s play area so Gracie was fully occupied and Max was just a little bundle to smiles. He was only like 6 months old himself. Anyway, after a while Sadie came and gathered her kids up and left so I went back to be with Keri and Camille and Dawn. We took pictures with Toni and Andrea and then with just us. What a happy exhausted family! A few minutes later, we were about ready to pack up and head home. I brought the car closer and Dawn and I figured out how to set up the car seat. I had brought the actual seat in to the Air conditioning before but we needed to attach the base. I loaded up Dawn’s and our luggage and we were ready. We put Camille in her car seat and walked her out to the cooled car. Keri slowly hobbled down and climbed into the back seat next to Camille. Dawn got in and we were out of there! 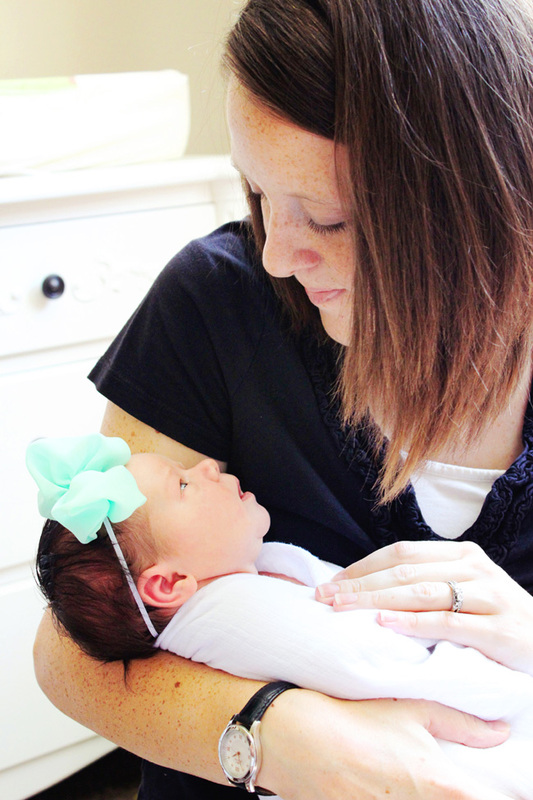 When we got home, Keri crawled into bed and she and Camille began nursing and resting again. That is pretty much how the next couple days went. Sleep, eat, poop, giggle, etc. What a wonderful birth experience!